On Episode 180 of CrossFit Radio, host Justin Judkins interviewed Corey Pitsillidi, who was the media director for the Australia Regional. Corey has used CrossFit to overcome debilitating injuries sustained from a car wreck. Justin also interviewed North West Regional winner Jesse Disch. This episode was webcast live at 6 p.m. PDT on Wednesday, July 13, 2011. 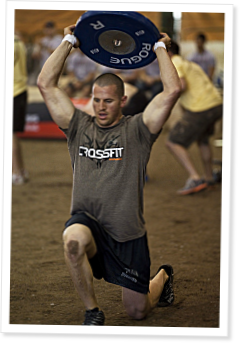 7:55 Corey Pitsillidi is a trainer and owner at CrossFit Plus and was the media director for the Australia Regional. What most people don’t know about Corey is that three-and-a-half years ago he was severely injured in a car wreck. He was in a coma for three weeks and had to relearn simple tasks like breathing and walking. Corey found CrossFit and had amazing results, both physically and mentally, and his doctors and specialists were amazed at his recovery. Corey described that recovery and shared his thoughts on the upcoming Reebok CrossFit Games. 26:05 Jesse Disch recently won the North West Regional and came on the show to talk about his preparations for the Reebok CrossFit Games. He explained how he fits in two to three workouts a day and why he follows CrossFit.com programming. Jesse works out in his garage, and he described how his personal gym has come together over the years. Most CrossFitters believe food is important, but Jesse takes things to a new level by raising chickens in his back yard. Finally, he gave his thoughts on competing at the Games this summer and how he will taper before and recover during the event.